Justice represents balance, equilibrium, decision-making, reason, clarity, objectivity, and honesty. Justice is card 11, placing it at the exact center of the Major Arcana, which is not a coincidence. 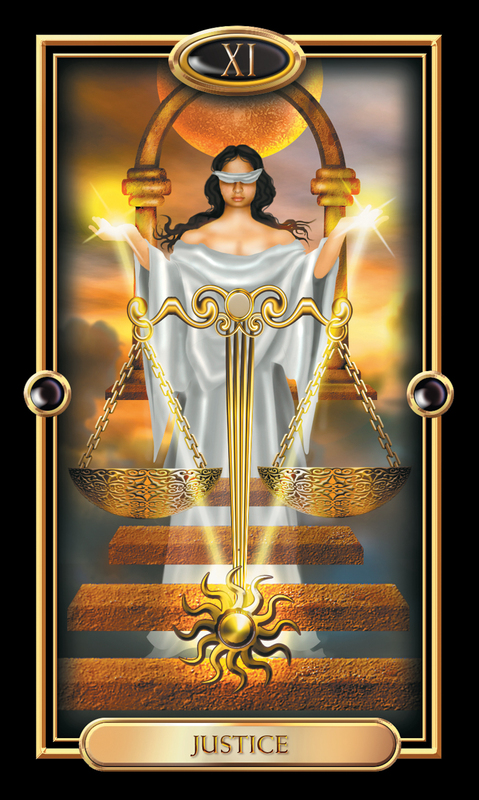 The woman on the Justice card holds the scales of balance precisely even, and her sword is exactly straight and centered. She represents the powers of objectivity, clarity, fairness, honesty and the ability to form and execute a decision. Her sword represents the penetrating, dissecting, ordering powers of mental clarity and judgement, as well as the ability to discriminate between right and wrong, or truth and falsehood. While the sword-wielding Judge also symbolizes the harsher aspects of the penal court system, it is noteworthy how different this card is from the Emperor, another card which can represent government and institutions. The judge on this card is female, suggesting compassion, mercy and emotional understanding, contrasting strongly with the severe, impassive gaze of the Emperor. She is sitting down, symbolizing the calm, patient and contemplative mind of the judge, yet she has one foot extending forward, as if ready to stand at a moment’s notice, with a weapon to enforce a punishment if it is required. This is not simple understanding of justice, but justice in action. The card thus signifies integrity, authenticity and fairness. It is the union of fair, reasonable study and understanding with measured, appropriate action. The Justice card also represents the attitude which we all must take toward ourselves and our own lives. We cannot change the past, and we must accept the consequences of our actions, as well as personal responsibility for our own future. We must have integrity, objectivity, honesty and mercy toward ourselves, as well as the ability to make a decision and enact change, especially where correction, improvement or discipline is needed. The card also evokes the balance or center one attains from being honest and doing what is morally right; then, no matter what may transpire, one is fortified from within, and has the inner serenity of knowing that he has been true to himself and his highest principles. The Justice card is ruled by the zodiac sign Libra, and Libra is ruled by the planet Venus. The Justice card represents legal matters, spiritual laws of truth, and cause and effect and serves as a reminder that things will work out in your life according the quality of effort and work you dedicate to what you want to achieve. Now is a key time to believe in your own success and put in the work so you can reap the rewards soon. No one can stop you, other than yourself. When the Justice card is reversed, it can represent injustice, unfairness, or imbalance in your life. You may be getting either too much or too little of what you need at the moment, which may mean you are on the wrong path or spending too much time with the wrong people. The Justice card can represent a need for balance between your work life and your personal life. You may feel more confident and comfortable in one of these aspects of your life over the other, but balance will only occur if you invest time and energy in both the work and personal portions of your life. Balance will help you thrive. The Justice card may signify a relationship change in your life. If you are in a relationship, then you may be questioning how much longer you and your partner will remain together. If you are single, you may soon find commitment making its way into your life. Focus on staying resolute in your relationship desires so you can find your answers you seek even sooner. The Justice card often means that you are going to experience a time of financial luck. This is a good time to gamble and make investments. Even if you do not gamble, you may very well receive money that you were not expecting, so use it wisely. The Justice card can reveal a need you are feeling for spiritual connection, balance, and grounding with the Earth and other people. Keep an open mind and a good perspective on life, and you will be able to find your spiritual center soon.